Dear Mary & Steve, Just a short note to let you know how Mack is going. He is showing great potential in both the paddock and in the yards. He is backing very well for his age and is displaying all the signs of developing into a very well rounded dog. We saw Noonbarra Mack at a Yard Trial at Quandialla and he was doing a run when we arrived so we didn't know who he was but we liked his style and natural balance. Craig did a really good job on difficult sheep and although he didn't get into the final (he didn't finish the trial in the time limit of 10 minutes), we thought he did a nice smooth job and can certainly see him winning big trials with a few years maturity. 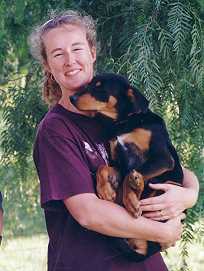 Laurelle is an Australian Yard Dog Sheepdog trialist in Victoria, Australia. She drove up and bought Noonbarra Blitz with her friend (and fellow sheepdog trialist), Sharon Barry who owns Futura Ned and who at the same time bought Noonbarra Rumour from us as a trial dog in the future. Both these Kelpies were showing very good working potential in the yards and field when purchased. "Little Blitz is just great. She loves the girls and is really gentle with them. She just lays down while they pat her and cuddle her and she seems to find it very hard to take! She is so responsive and we have great walks on the lead. I haven't done any sheep work with her yet as I just want to spend time bonding with her before I put that pressure on her. I really want her to feel secure with me before those challenges come." - Laurelle. "I am really pleased to read how happy people are with Blitz's litter. You already know just how rapt I am. I had her begin to speak on command, not fully yet but she was very keen and her bark, like you said, is very commanding. She loves her backing and is not afraid to take a large step from one sheep to the next if they are a body length apart. She does it so calmly and confidently and has started to take interest in looking a sheep in the eye if it is facing her. She will take a gentle hold, almost mouthing it and leaves it alone as soon as I ask. It nearly kills her to walk away from the sheep! We haven't got a "call off" the sheep going yet but she does "down" straight away when I ask her so that works for now. I took her to Tatura to the championships on the weekend for the experience and she loved it. She also loves Eley's puppies and thinks they are fantastic to play with. She adores our girls and is drawn to them when we are outside." 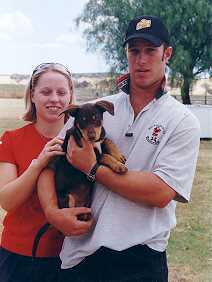 Noonbarra Blitz was mated to Noonbarra Hall and produced some outstanding puppies. Merrynvale Mambo has been retained in the Stud as a future sire. 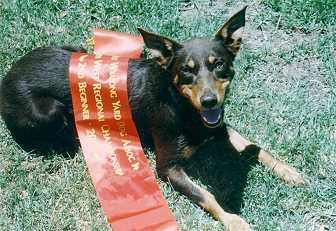 Noonbarra Buzz was sold to Robert Sandow on a cattle farming property at Barmedman only a few kilometres from where the Kelpie breed was first developed in the 1800's (Ardlethan). "Just thought I'd drop you a line to say hi and let you know that life on the farm is going well. I can sit very well and the boss is still going on about this here DOWN command. I can do that quite well too, although sometimes I think the boss needs more patience. There are no sheep on this farm but the cattle are good. I can glare at them and bark at them when the boss is about. ..There's a cat who lives here as well, but I think I've got it bluffed...I also got to ride on the motorbike. Pretty coolbeing up front but as I get bigger I'll have to ride on the back. Snooze time is a bit of a lark. a nice sunny spot in the kitchen. What more can a hard working/playing dog want. The Misses took some photos of the boss and I having a nap. Evidently we snore as well ! ... Bye Buzz. Noonbarra Butch II has been sold to Shaun Wilson of the Yaldool Kelpie Stud at Braidwood. 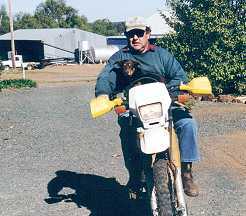 He was named Butch because Shaun always liked old Noonbarra Butch who won the State and Australian National Championships. Not wanting to cross at all. Always aware of my presence. Wanting to keep working . Owned By Robert Edwards. Trundle. 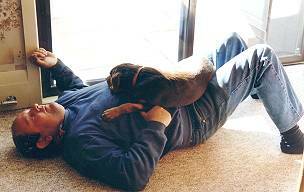 Robert phoned when Spike was 7 months and said;" Spike is a very good looking dog. He's very confident and intelligent and a real mate. He's friendly and likes people and everyone loves him. He is curious and interested in everything that is going on. He is fearless but responds well and wants to please." " When Spike first started to work he was a watcher and a stalker. He has a lot of natural ability and is now extremely keen and getting pushy on sheep. 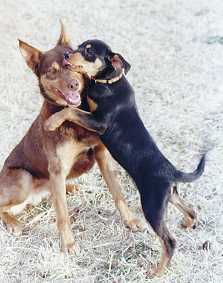 I am very happy with Spike and might get another dog from you in the future." 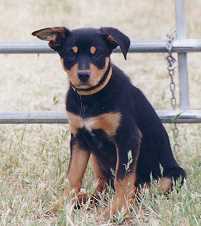 This Kelpie is the same breeding as our good sire, Noonbarra Max and Noonbarra Maggie at the Merrynvale Stud in Victoria. "Just wanted to thank you for everything with Jesse. I'm sure she will be everything we could hope for and more. We'll keep you posted on her progress and hope to do business again with you in the near future." 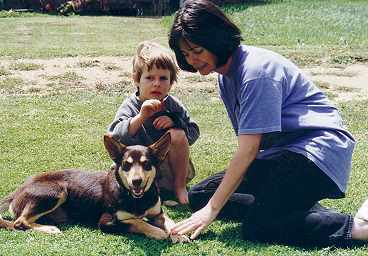 Noonbarra Milo was a well started young Kelpie that we sold to Geraldine Brooks. Geraldine is a famous journalist and author. Her book, 'The year of Wonder' was on the bestseller list for months. Geraldine is a friend of Richard Glover (author, journalist, radio personality) who owns Noonbarra Darcy. 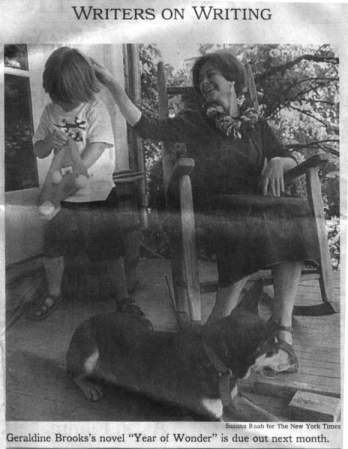 She wanted a dog older than a puppy who would get on with her young son. Noonbarra Milo lived for some months in the Balmain area of Sydney and as Geraldine put it 'became part of Cafe' society'. He also played with Noonbarra Darcy and other Kelpies around the inner city. 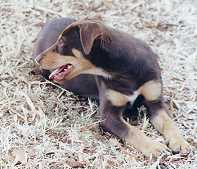 "Milo is sitting out on the front verandah chewing a bone right now and keeping a watchful eye on passers-by. I'm trying to persuade him that he is not responsible for the movements of the entire street and he's beginning to absorb that message. He's a lovely addition to our household." " He looks great. Sleek and shiny. ... He gets a lot of compliments walking around Balmain, everyone wants to tell you about the great Kelpie they, or their parents once had. (Tony says Milo is an absolute babe magnet - says he hasn't been chatted to by so many good looking young women since he was a bar hopping undergrad .. 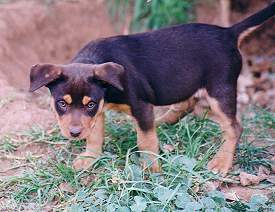 I find it's the tradies on building sites who want to talk Kelpie...)"
Then Geraldine moved to her farm in Virginia, U.S.A. and Milo went as well. 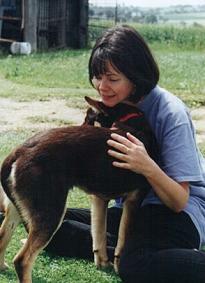 He now lives happily on her farm with her other dog, a Border Collie.
" I thought you'd like to see that Milo has made it into the New York Times. He is settling down into a wonderful dog... We are starting him out on sheep again this weekend. We wanted to get him settled first. He loves it here.